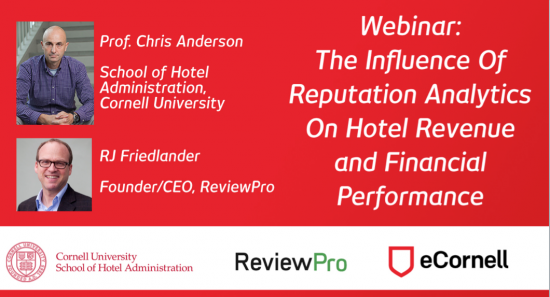 Previewing a study to be published later this summer, Chris Anderson of Cornell University unveiled more research linking ReviewPro’s Global Review Index (GRI) to the financial performance of hotels in an online event hosted yesterday by eCornell. Thousands of hospitality and finance professionals signed up – shattering eCornell’s previous registration records – to learn more about how insights from review analytics can be used to drive hotel revenue growth. After reviewing this earlier study, Professor Anderson demonstrated to attendees how he was able to use the Global Review Index – paired with income statements – as a leading indicator for the share price movements of 19 leading US-based lodging REITs in a simulation over 18 months. The impact of this is huge for the financial industry. You might also say it’s an intuitive finding: if hotels make more money by increasing their online guest satisfaction, it makes sense that the valuation of those hotels – and the companies and investment groups that own them — will tend to increase in value as their GRI score increases, all other factors being equal. While more and more researchers, consulting organizations, advisory groups and investment firms are using ReviewPro data to analyze growth opportunities in transactions and portfolio asset management, the clear takeaway for the hotel industry in general is that managing online reputation – specifically improving guest satisfaction by increasing operational effectiveness and efficiency – pays off financially. Guest experience factors are now the #1 criteria travelers today use to select hotels – more than price and location. Consumers are using hotel reviews at the point of purchase to make their final decision, making it imperative for hoteliers to actively manage their online reputation across the web – in every channel and in every language. The findings presented this week are a breakthrough for big data, online review analytics, and ultimately guest service design: when the Global Review Index affects a company’s earnings potential, reputation management for hotels moves from a “nice to have” activity into a cornerstone of financial performance. Update: The full study has now been published here. In the meanwhile, contact a ReviewPro specialist to discuss how you can turn online review analytics into insight for action – and improve financial performance.